An old Cherokee describes an experience going on inside himself…. “It is a terrible fight and it is between two wolves. guilt, resentment, inferiority, lies, false pride, superiority, and ego. benevolence, empathy, generosity, truth, compassion, and faith. He perceives the motive of a desire, and discerns the aim of an aspiration. He fully knows, sincerely loves and gently cares for each one of us, His people, His creation. 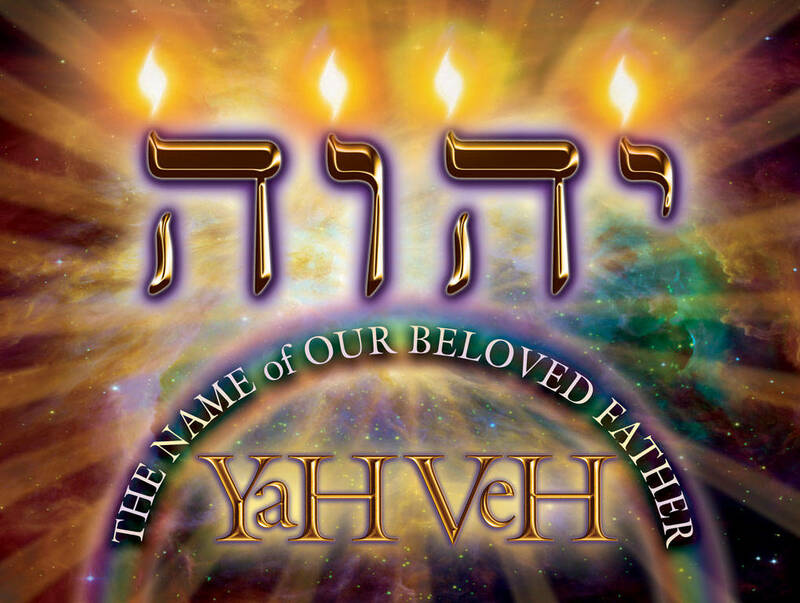 "I am Yahweh. That is My Name"
LIFE and His Son, YESHUA. in Him and His Son, YESHUA. Give God the first part of every day. Give God the first day of every week. Give God the first portion of your income. Give God the first consideration in every decision. Give God the first place in your life. the clearer we see His guidance. Gently guides my little craft with safety to the shore. Sunshine and joy after rain. and the Destiny of our Soul! God be at mine end, and at my departing. TIME IS A GREAT STORY TELLER. TIME cuts down all, both great and small. TIME is the wisest of all counselors. TIME is a great teacher, but unfortunately it kills all its pupils. Spend it in the Right Place! Give thanks, Sing praises to Him and to the only One True God shall every soul forever laud! The law of the LORD is perfect, reviving the soul. The statutes of the LORD are trustworthy, making wise the simple. The precepts of the LORD are right, giving joy to the heart. The commands of the LORD are radiant, giving light to the eyes. The fear of the LORD is pure, enduring forever. May the LORD answer you when you are in distress; may the name of the God of Jacob protect you. May he send you help from the sanctuary and grant you support from Zion. May he remember all your sacrifices and accept your burnt offerings. I waited patiently for the LORD; he turned to me and heard my cry. He lifted me out of the slimy pit, out of the mud and mire; he set my feet on a rock and gave me a firm place to stand. He put a new song in my mouth, a hymn of praise to our God. Many will see and fear and put their trust in the LORD. Blessed is he who has regard for the weak; the LORD delivers him in times of trouble. The LORD will protect him and preserve his life; he will bless him in the land and not surrender him to the desire of his foes. The LORD will sustain him on his sickbed and restore him from his bed of illness. God is our refuge and strength, an ever-present help in trouble. Therefore we will not fear, though the earth give way and the mountains fall into the heart of the sea, though its waters roar and foam and the mountains quake with their surging. In His presence, is Prayer! Thank God In Food, that you eat. Thank God In Family, that you have. Thank God In Friends, who stands by you. Thank God In Finances, that you shall not be in want. the hands of [the] living God. and righteousness in the earth. For in these I delight. "GRAIN MUST BE GROUND TO MAKE BREAD"
others when we cease to bleed. I will not doubt though all my ships at sea, come drifting home with broken masts and sails, I shall believe the Hand that never fails, from seeming evil worketh good for me. And though I weep because those sails are battered, still will I cry, while my best hopes lie shattered, I trust in Thee. Do not say all you know, for he who says all he knows often says more than he knows. Do not tell all you hear, for he who tells all he hears often tells more than he hears. Do not spend all you have, for he who spends all he has often spends more than he has. Do not covet all you see, for he who covets all he sees wants more than he sees. Focus on things you can. if you want your life to CHANGE. To trust in God and Heaven securely. As no man can restore. even if it's a handful of earth. even if it's a tree that stands by itself. even if it's a long way from here. even if it's easier to let go. even if I'm gone away from you. What Hast Thou Done On Earth? "What has thou done on earth?" The Winner is always a part of the answer. The Loser is always a part of the problem. The Winner always has a plan. The Loser always has an excuse. The Winner says, "Let me do it for you." The Loser says, "That's not my Job." The Winner sees an answer in every problem. The Loser sees a problem in every answer. The Winner sees a green near every sandtrap. The Loser sees a sandtrap near every green. The Winner says "It may be difficult but its possible." The Loser says "It may be possible but its difficult"
Instant Gratification or Protecting Your Future?